Consequently, many in India started comparing Canadian PM’s impromptu answer to the question about Quantum Physics to Mr Modi’s comments on scientific issues including his comments on climate change, ganesha being a case of plastic surgery and the mythological character Karna being a case of genetic engineering and so on. Facebook page ‘Thinking Ape’ put up a video juxtaposing Mr Modi’s comments on plastic surgery and Trudeau’s comments on quantum physics. 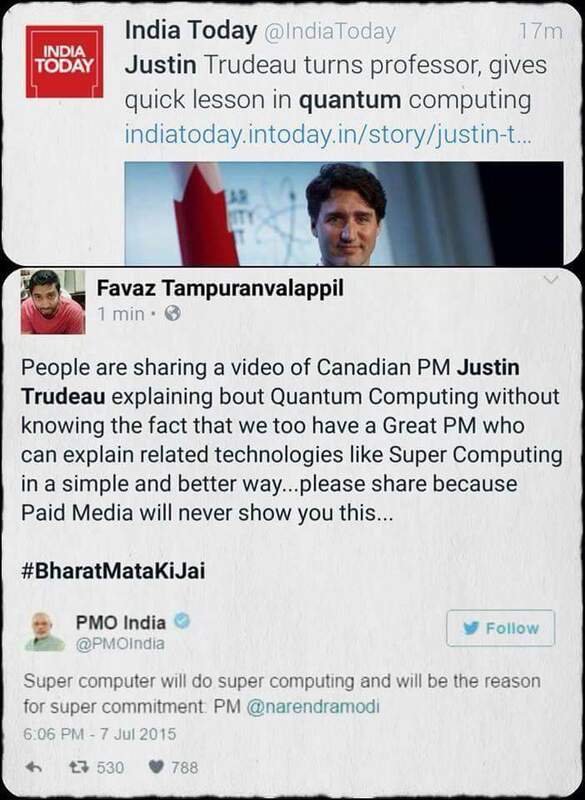 This particular comparison of Mr Modi’s comment about super computing wherein he states “Super computer will do super computing and will be the reason for super commitment” and Justin Trudeau’s comment on quantum physics became viral soon after. There were also many critical comments about Mr Modi’s approach to science and his penchant of clubbing mythology and science. [pullquote align=”full”]I am like wow after this. Had read about the great Dinanath Batra and his rubbish of having airplanes (think: garuda viman), artificial insemination (think: birth of karna) and plastic surgery (think: ganesh and the elephant head) in ancient india, who was actually forging what books students would read in schools in gujarat and haryana etc. But I had never imagined our prime minister utter the same words. Our prime minister. The most important person in our country at least theoretically. [pullquote align=”full”]Though knowledge of science or physics is no prerequisite for being a leader. We should not judge our leaders in them. [pullquote align=”full”]Canadian Prime Minister Justin Trudeau versus Indian Prime Minister. One shows his flair for scientific temper and Technology & knows a bit about next generation Quantum computing, Watch the other. The less said the better. Not so long ago, Trudeau had himself created a controversy of sorts by comparing himself with Mr Modi when he had said “I have more Sikhs in my cabinet than PM Modi”. This time around, his stunning riposte has started yet another comparison of Mr Modi and himself. This is probably going to happen again as the Canadian PM continues to become very popular on social media, a space Mr Modi successfully captured on his way to becoming the PM of India.